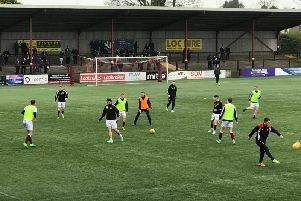 Raith Rovers spared themselves from defeat - and kept Arbroath's title champagne on ice for another week - following an injury-time equaliser at Stenhousemuir. It was skin of the teeth stuff at Ochilview as Rovers relied on a slice of luck for their narrow escape, Liam Buchanan pouncing on a defensive mishap to cancel out Mark McGuigan 58th minute opener, which on the balance of play, was cruel on the home side. The Warriors lived up to their name, showing all the attributes you would expect from a team fighting for survival at the foot of the table - aggression, hunger, desire - and for the most part, Rovers were unable to match them. Stenny looked a more capable outfit than their last place position would suggest - over the past six games they are fourth in the form table. Nonetheless, it was largely uninspiring from the Kirkcaldy side, not dissimilar to the vast majority of their away struggles this season, albeit the more recent habit of mounting late comebacks is something the team can take into the play-offs. Rovers scored during an extended period of injury-time after the second half was held up for several minutes for an injury to goalkeeper Robbie Thomson, who left the pitch in agony on a stretcher after collapsing with no-one near him. The early indications that he has suffered a damaged achilles, which is likely to end his season - a horrible blow for the player, and the club, now potentially nursing five long-term injuries. Rovers kept faith with the side that finished the game at Bayview the previous week, which meant Nathan Flanagan and Craig McGuffie were promoted to the starting line-up, although Iain Davidson dropped out in order to rest an ongoing back injury, replaced by Dave McKay. Ross Matthews and Liam Buchanan also dropped to the bench, but any hope that the team would pick up where they left off at East Fife soon dissipated. The first half, particularly the opening half an hour, was not pleasant viewing for Raith fans with Stenny making all the running, winning all the second balls, and creating the best chances. Greg Hurst and McGuigan were proving handful up front, while the midfield support was plentiful - an area where Rovers were posted missing. The pressure was building and Stenny would have led on 23 minutes but for a terrific point-blank save from Thomson, who made himself big to deny Hurst, with Grant Gillespie completing the clearance off the line. Rovers were on the back foot and spending most of their time clearing their lines, but Callum Crane and Nathan Flanagan were offering an occasional outlet down the left, only for their delivery into the box to let them down, time and again. It was the latter who had Rovers best chance of the first half on 38 minutes, bending his run to latch onto a Nat Wedderburn pass to move clear on goal, but the winger's final attempt lacked conviction and Graeme Smith was able to turn the ball behind at his near post. As half-time approach Raith were starting to get a foothold, and the improvement showed signs of continuing into the second half with neat passing moves again putting Crane into good positions at the left by-line, but still there was no end product. Then, as is the script for Rovers on the road, a loss of concentration at the back cost them the opening goal. Captain Euan Murray stepped out of defence to win a header, but he was unable to recover his position as the ball was returned, leaving McKay to defend a two-on-one. An exchange of headers between Hurst and McGuigan put the latter through on goal and he slotted the ball beyond Thomson. Rovers were now in familiar territory as they found themselves behind for the eighth away match running, but unlike last week's late turnaround in the derby, there was little to suggest they could dig themselves out the latest hole. For the second week in a row, John McGlynn opted for a double substitution around the 65-minute mark, bringing on Matthews and Buchanan for McGuffie and Jamie Gullan, and the fresh legs injected some impetus into the performance. Kevin Nisbet had half a glimpse of goal and volleyed wide, while Morgyn Neill cleared a Murray header off the line, but the pressure was nowhere near intense enough to suggest Raith could create the chances required to salvage something. In the end, the chance was created for them as Murray won a flick-on, Neill sliced an attempted clearance over the head of his own goalkeeper, and although Smith back-pedalled to palm the ball out, Buchanan reacted sharply to smash it into the net. That was in the 93rd minute but the game would continue for another five minutes before the referee blew for full-time, with neither side looking particularly pleased with the outcome as they left the field, but for different reasons. In the circumstances it was certainly a better point for Raith, who have now lost just once in eight games, but the search for the consistent level of performance required to win promotion via the play-offs continues into the final four games of the season.